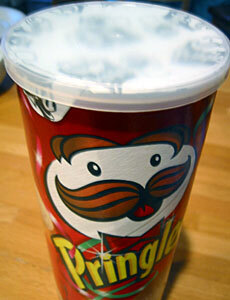 Pringles are a pretty awful thing. Basically they’re like eating deep fried instant potato with a nasty oniony after taste. All in all a million miles from snacks such as spicy peas or habas mujados. Anyway i digress. What bothers me most about this product are the adverts which claim “once you pop [the lid] you can’t stop”, as if they’re as addictive as crack-cocaine (drinking sea water, more like). If this really is the case, why do they need a resealable lid? A Whatfettle article by Paul Downey published Sunday, November 28th, 2004, at 6:06 pm under a Creative Commons License.